Crashing waves and famous sunrises. Tropical drinks on oceanfront decks. work for you. We're happy to help you. Hotel amenities include two outdoor and two indoor swimming pools, hot tub and a 300-foot lazy river that surrounds a putting green and overlooks one mile of traffic-free beach. The hotel features a lounge, dining room, convenience store, game room, fitness room, and golf-training center. This property offers gated, landscaped beach access, Internet access, free parking, children's activities, laundry services and a restaurant. All rooms feature kitchens with full-size refrigerators, microwave, dishwasher plus washer/dryer, ceiling fan, central air-conditioning, iron/ironing boards, DVD/CD players, dishes and utensils, hairdryers, balconies, and cable TV. Jacuzzi units available in most deluxe units. Cribs are available upon request. At the heart of Daytona Beach’s most famous shoreline, Ocean Walk Shoppes & Movies is a collection of upscale eateries and boutiques plus a 10-screen movie theater. A live web cam at www oceanwalkshoppes com allows guests to view the Ocean Walk Shoppes, Bandshell and the Atlantic Ocean. Ocean Walk Daytona Beach has an energy all its own. There's loads to do here, both during the day and at night. The hard-packed sand makes for fun shoreline bike rides or a stroll along the beach. Barreling waves make the area a surfers paradise. But that's not to say you can't relax here. Sunbathe on a chaise lounge. Soak in the outdoor hot tub with friends under the stars. Or park yourself at a shaded table at a waterfront restaurant and enjoy fresh-caught seafood. This place, with its history of grand hotels, car racing and speed, was once a playground for the wealthy. It's now also a gathering place for families who return year after year for the mix of family-friendly accommodations and activities. 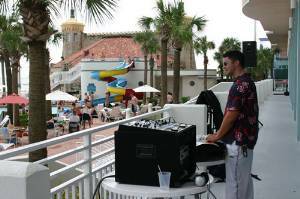 Centrally located in Daytona Beach, Ocean Walk is in the heart of all the action and caters to both families, couples and visitors young and old. A muliti-story building with stylish Art Deco design and a wide, expansive beach, the Ocean Walk Resort is a true beach resort, where guests can lounge on a poolside chaise and gaze out at the ocean through a frame of palm trees. The resort has a that runs throughout, from the ice blue and sea green Landing Bar lounge to the two indoor pools. 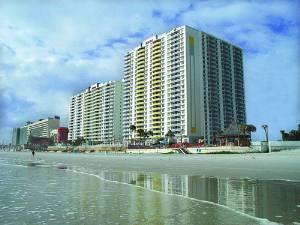 Rent a beachfront vacation rental in Daytona Beach, Florida for unlimited fun in your beach vacation in Florida. 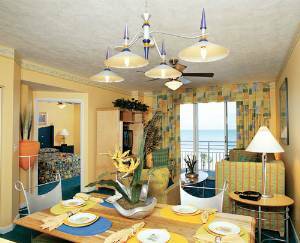 This vacation condo offers spectacular ocean views as well as beach views. Due to its location right on the beach, you enjoy direct access to the beach – start enjoying your beach-break the moment you enter the complex. Being located on a “no-driving” portion of the beach, you need not worry about your kids. Cool out with a splash in any of the four resort pools – there are two outdoor pools and two indoor heated pools. Pamper yourself in the brand new Vacation Therapy spa, or relax in one of 3 outdoor hot tubs. This vacation rental in Daytona Beach offers amenities for the whole family: craft classes, organized pool and beach games, "junk food" bingo; teen dances, ice cream socials, pool side "dive in" movies, computer room, arcade etc, etc, etc. Relax in the 250' “lazy river”. Enjoy a day of unlimited fun with the many games, thrill rides, and shops at the Daytona Beach Boardwalk. And while you are here, don’t forget to visit Daytona USA - the home of NASCAR's Daytona 500 – a major motor sports attraction. 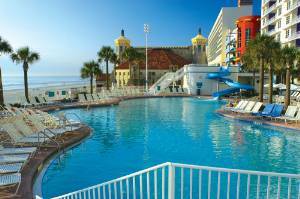 A range of recreational activities can be pursued while on vacation in Daytona Beach, Florida. Start your day with a work out at the gym. Enjoy playing golf in the 9-hole indoor putt putt or head to the world-class golf courses in the vicinity. 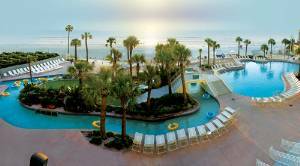 Welcome to the incredible Wyndham Ocean Walk beachfront resort where you'll enjoy a host of amenities and a spectacular entertainment complex right next door at the Ocean Walk Shoppes..
Daytona! It's more than just a beach! Come discover great golf, exciting attractions and the Daytona International Speedway. 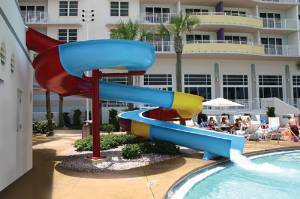 Ocean Walk Resort is a water-play paradise, featuring 2 indoor and 2 outdoor heated pools, a giant waterslide and a 250-foot lazy River to float along. Daytona Beach Oceanwalk offers vacationers the most luxurious accommodations plus many amenities available at 5 star resorts. The resort is conveniently located near shopping, restaurants and attractions. For a little pampering visit our new exclusive spa. Plus, there's an interactive-aquatic playground for the kids! Indoors the resort offers a state of the art exercise center, game room and computer center and a 9-hole mini-golf course, plus Fitness Center, Children's Arcade Room, Children's Activities, on site Cafeteria and on site Lounge. Oceanwalk is just 2 blocks from the recently renovated Main Street Pier in the heart of town on the famous boardwalk of Daytona Beach. You'll find shops, restaurants and movies just steps away from this upscale Daytona Beach resort. And with the area's only traffic free beach and an array of outdoor activities, Wyndham Oceanwalk Resort is simply terrific for families. Get the best vacation value. Leave the ordinary Daytona Beach hotels behind and live it up in the condominium accommodations of Wyndham Oceanwalk Resort. With a spacious living area and a fully equipped kitchen, there's plenty of room for the whole family. It's like having your own vacation home with a world of entertainment right outside your door. Crashing waves and famous sunrises. Tropical drinks on oceanfront decks. Surf shops and sophisticated nightspots. If these attributes sound alluring, DAYTONA BEACH is likely the place for you. For the little, and not so little ones, Orlando's many theme parks are just an hour away. The Kennedy Space Center to the south and Historic St. Augustine to the north are each less than an hour away. The Daytona Beach area is home to numerous championship golf courses including the LPGA, offering challenging play for golf enthusiasts at all levels. Plus, there are plenty of NASCAR thrills for racing fans at Daytona International Speedway and at Daytona USA, NASCAR's Motorsports Attraction! Countless hours of fun await guests of all ages in the 5,000 square foot activities center. From Popsicle Boat Races, Jewelry Making to Karaoke, are just a few of the detailed daily activities. Our on site directors work 7-days a week to ensure you have the vacation you've always dreamed of. The oceanfront, art deco-style Wyndham Oceanwalk is located in a traffic-free beach area, a quarter-mile from Adventure Landing, and approximately 10 miles from Daytona Beach Airport. This location is also half a mile from Main Street Pier, five miles from Volusia Mall and Daytona International Speedway. Cultural and historical opportunities also abound… the Ponce Inlet Lighthouse & Museum, Seaside Music Theater and the Museum of Arts & Sciences all provide for an engaging day's outing. Deep sea fishing excursions also are available through a number of nearby charter companies. Water skiing is available. Adjacent to the resort are the Ocean Walk Shoppes, a truly unique oceanfront entertainment and shopping complex featuring the 10-screen all digital sound Ocean Walk Movies 10. Chose from an array of options for lunch or dinner. The Bubba Gump Shrimp Co., Adobe Gila’s, Johnny Rockets, Cold Stone Creamery, Planet Smoothie and Starbucks are just steps from your front door. Find the perfect souvenir or gift at Harley Davidson Apparel, Maui Nix Surf Shop, Bath Junkie or the Candle Gallery, just to name a few. Also adjacent to the resort is the Historic Daytona Beach Bandshell where free concerts and events are held throughout the year. And just down the beach is the Historic Daytona Beach Pier, where guests can enjoy a birds eye view from the Atlantic Ocean on the Sky Surfer and Daytona 360º Tower rides. Across the street from the Resort is the all-new Daytona Lagoon (opens Spring ’05)… a waterpark and family fun center featuring 6 giant slides, wave pool & lazy river, rock climbing wall, Lazer Tag, mini-golf, go-karts, arcade and much, much more! You don’t have to go far to find great golf courses in the Daytona Beach. You’ll find something for everyone including championship designs from such names as Arnold Palmer, Donald Ross and Gary Player. From the famed LPGA International courses to the highly acclaimed Indigo Lakes Golf Club, you’re sure to discover a fun challenge. Plus if you’re a real fan of the game, the World Golf Hall of Fame is just an hour to the north on 1-95. If you want to practice your putting stroke Wyndham Ocean Walk resort offers an outdoor island putting green. Cancellations and Refunds: To hold the room: 50% down 60 days prior to arrival and remaining balance must be paid 30 days prior to arrival. Payment by PayPal is preferred. Personal checks and USPS money orders are also acceptable. All monies are non-refundable within 30 days of check-in. If cancelled outside the 60 day period deposits are refundable, minus Paypal fee. All monies are non-refundable within 30 days of check-in. We do make an exception if the resort is closed for your stay. In this case a full refund will be issued or 100% of payments can be applied to a future stay. Other Fees: Guest Confirmation Certificate $25 is waived when you pay in full 60 days prior to check-in. Required Stay: Weekend rate not available.